Once you begin to play tier 3-4 tanks you'll be rudely introduced to the next game mechanic: STUNS! In update 9.18 stun mechanics were introduced into WoT in order to curb the damage that Artillery units spat out, in exchange for a target de-buff. This nerf to damage, and introduction of stun was to firmly place artillery into a support class. Good intentions, but in practice one of the most frustrating experiences you can have in world of tanks. Especially when receiving multiple rounds; the stun duration can feel like an eternity. If you are brand new to the game you may be new to the general hatred that artillery generates - sometimes in game, sometimes on the forums or the subreddit. The reason many players hate artillery is because it can damage and stun them with no real risk to itself. This creates a one sided engagement and can be extremely frustrating to be on the receiving end with no way to retaliate. There have been many reasons the developers decided to implement this type of game mechanic - one of which is to prevent camping. The statement "stop camping" is a tongue in cheek expression that implies that the only reason you are hit is because you are camping even though most people that get hit by artillery are actively engaging in combat. What ever you opinion is on artillery it's in the game and is a game mechanic you must understand and predict in order to maximize your efforts in each battle. If you look up the HE shell characteristics of each SPG, you'll notice they include a maximum and minimum stun duration. The actual stun duration consists of two variables. One variable is permanent - the minimum stun time every tank you fire at will suffer. The other is a dynamic variable (that's added to the permanent). This variable determines how much stun time the target suffers beyond that of the minimum. Wargaming has yet to share the exact mathematics with us, but we can infer that this variable stun time is likely going to operate extremely similar to HE damage mechanics. This means distance to the splash center, armor thickness and spaced armor will lower the dynamic stun variable. Large and small first aid kits can be activated to immediately lift the stun. Total stun time can be reduced by medkits (for 5%) and by spall liners (for 10%). These reductions are additive. Note that a spall liner will also reduce the dynamic variable, making it's benefit against artillery 2 fold. If a tanker is special enough to be targeted by multiple members of the fun police at roughly the same time then the stun time is calculated separately for each shell. The countdown begins from the first shell. Should a second shell hit and overlap the previous shell, the target still only suffers one timer - and the time will extend beyond the first stun, if the second stun duration is calculated longer than the current timer. In the above image the first SPG stuns your tank for 9 seconds. When you are hit again by the second SPG, it's stun overlaps, but the stun is not long enough to extend the total stun time. Your stun duration therefore doesn't change. The 3rd SPG impact at the 4 second mark then calculates it's stun and extends your timer for another 7 seconds, making your total stun time 16 seconds of pure bliss. I would like to remind you to stop camping. When SPGs share their love with your crew they suffer a bit of shell shock which the game simulates by lowering your vehicle operating parameters. Not all stuns are created equal though. The stun effect, just like it's duration consists of 2 variables. A permanent variable that guarantees your target suffers a stun effect of at least 75% of the maximum. The second dynamic variable is added to the first and depends directly on how much damage was suffered. Wargaming again has starved us of the actual math that determines the stun effect modifier. If you are once again blessed by the hand of Serb by receiving more than one overlapping compliment, you will still only suffer one stun effect which is delivered by which ever shell provides the largest decrease coefficient. 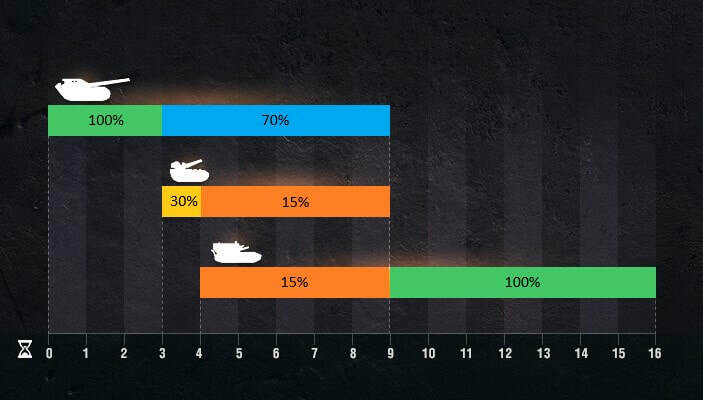 In the above graphic we can see that since the first SPG has higher coefficient it's effect is used over the second SPG. The 3rd SPG has a coefficient that is even higher than the first 2 so it's modifier is then used. I'd also like to remind you to stop camping. When a tank takes damage while the stun timer is counting down, it provides assisted damage to the respective SPG(s) that stunned that target. The first to stun will receive 70% of this total amount. 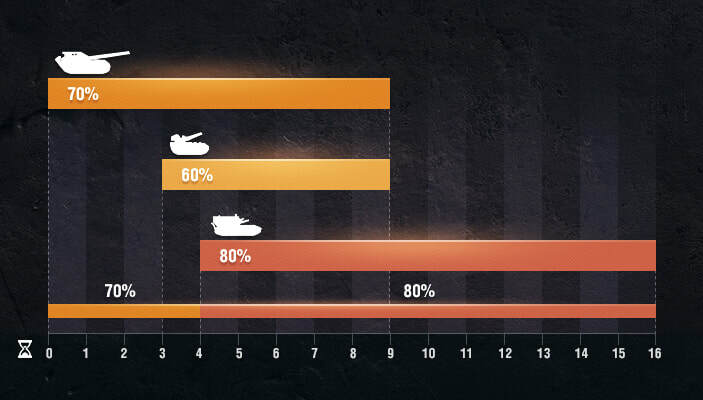 The remaining 30% of assisted damage is evenly split between all the other SPGs that participated in the arty party. ​If a single SPG stunned the vehicles that were damaged, then that SPG gets all the assisted damage. The visual image below helps illustrate how the assisted damage is shared between SPGs. If an SPG tracks it's target it will also get assisted damage for that. If a target is hit by an SPG and is tracked, and immediately lifts the stun with a medkit but remains tracked, that SPG will still receive assisted damage for any damage that tank receives while it is immobilized. Drowning will apply a penalty to experience earned, and force the largest repair bill possible for the vehicle. Never intentionally drown!